7.0 / 10Not worth the drive but suitable sushi fare for local residents. 7.0 / 10Good service but I would only recommend if this was your hood – there is better sushi elsewhere in the city. Walking on the way to Sushi Kai from the Yonge/Eglington station I counted at least 3 other sushi restaurants. Wow, lots of competition here and I am sure there’s more in the area if we walked a bit north on Yonge. That’s probably the reason why they are offering that group deal that we are taking advantage of. It’s working because it brought us here didn’t it? 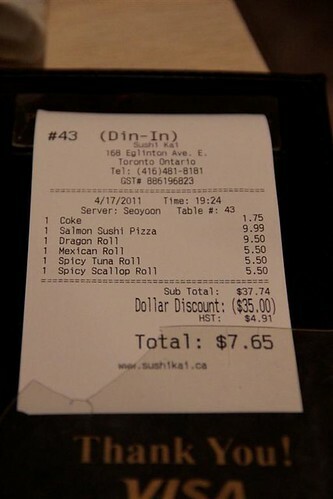 Indeed…We were hungry for some sushi and SushiToronto.ca was starving for content! As mentioned, the restaurant has hardly any outdoor light. 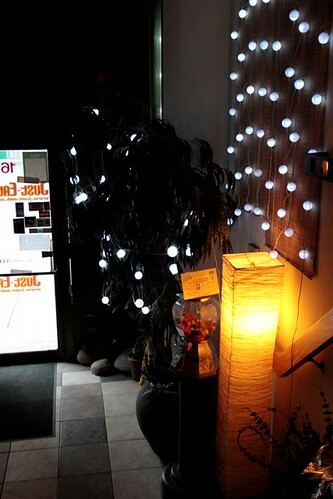 It opens up to a wider space as you enter. The decor is comfortable but definitely not high end. We were greeted almost immediately as we took our seats. This was at around 6:30 on a Sunday night with the restaurant being almost half full. Once seated, got a chance to browse their menus. They had lots of pictures which is always a plus. 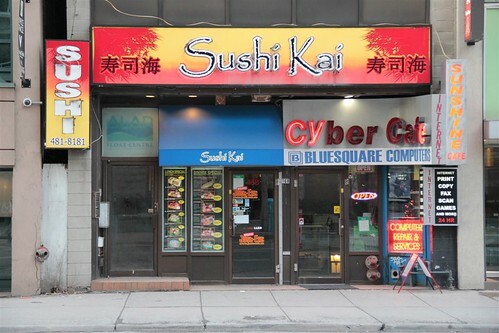 You mentioned that one Foursquare reviewer said that they “had the best sushi pizza” in Toronto. We were getting it anyway as per our standard but now I was even more anxious to try it! Yeah I noticed you loved the comic sans font! I think it’s the first time I’ve ever seen it used before. Oh well, in the end we went with Salmon Sushi Pizza, Spicy Tuna Rolls, Spicy Scallop Rolls (becoming a stable for us too), Mexican Roll and the Dragon Roll. The dishes came out quite quickly. I believe the Spicy Scallop and Spicy Tuna were out first. I can’t complain about either. Have we had better? For sure – but these were decent I thought. Yeah they were pretty decent. Can’t really complain about them. Tasted more or less like everywhere else. I did like the large chunks of scallops they used though. 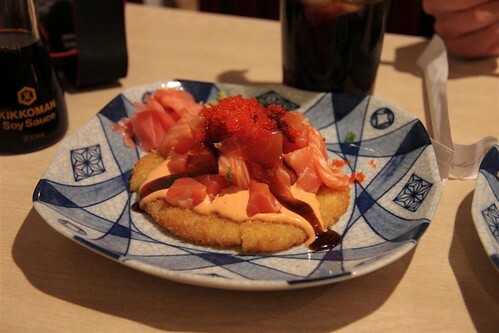 Next came the sushi pizza which looked like they just dumped a bunch of salmon pieces on top with spicy sauce. Not exactly the most elegant looking dish. Very true…It was nothing special at all, despite what the Foursquare tips tell you. It seems they didn’t try at all to make this a unique dish. The Mexican Roll and Dragon Roll come out almost immediately after. The food does come out pretty fast here. The Mexican Roll is basically a spicy Tuna roll with some chilli powder. Tasted okay but again nothing special. 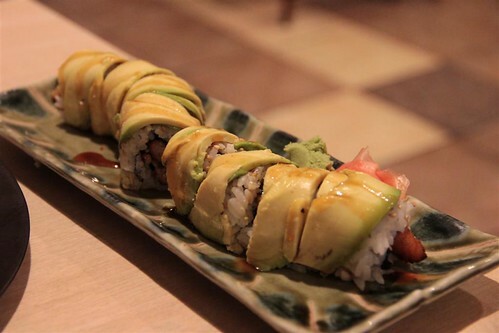 Same goes with the Dragon Roll. Tasted fine to me but nothing to distinguish with many other Toronto sushi restaurants. 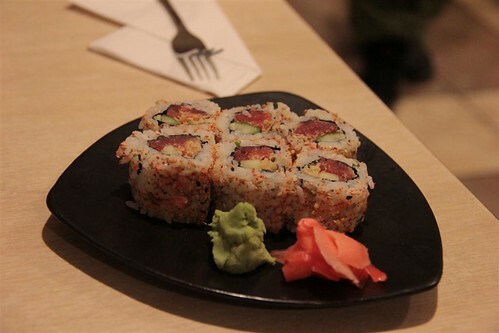 We took a bit of a chance on the Mexican roll, as we’d never seen that on the menu anywhere else before. It was interesting but I doubt I’d order it again. I thought the dragon roll was worse than most places. Not awful but not great. Sushi Kai seems to be very uninspiring. Everything is ‘ok’ or a bit better. I think it pretty much falls in the “yet another Toronto sushi restaurant” category. Once finished, the question of dessert came up. Will there be any? Could they instantly get a 0.5 bump from me by providing some free green tea ice cream? I assume there was none or at best, good old sliced oranges. Annnnnd…Nothing! No ‘dessert’. And no real end to the meal, actually. We just sort of waited there for a bit and eventually waved for our bill. Sushi Kai you may go to if you live in the Eglinton/Mount Pleasant ‘hood, but I advise it’s not worth the trip from afar. Nothing particularly poor – just nothing really great. Service was good. Food: average. Nice enough place. 7/10. Agreed. I think it works as a local neighbourhood sushi joint and I would probably go again if I lived in the area but it’s nothing special. 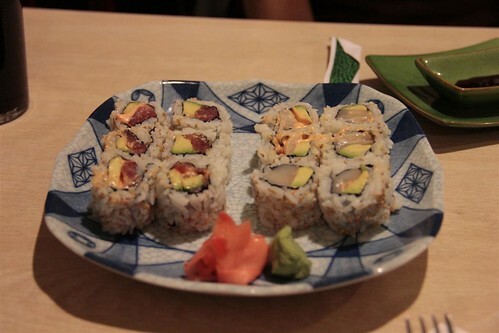 Friendly service and typical Toronto sushi = 7/10 for me as well.